Molly Murphy Sullivan's husband, Daniel, a police captain in turn-of-the-century New York City, is in a precarious position. The new police commissioner wants him off the force altogether. So when Daniel's offered an assignment from John Wilkie, head of the Secret Service, he's eager to accept. Molly can't draw any details of the assignment out of him, even where he'll be working. But when she spots him in San Francisco during a movie news segment, she starts to wonder if he's in even more danger than she had first believed. And then she receives a strange and cryptic letter from him, leading her to conclude that he wants her to join him in San Francisco. Molly knows that if Daniel's turning to her rather than John Wilkie or his contacts in the police force, something must have gone terribly wrong. What can she do for him that the police can't? Especially when she doesn't even know what his assignment is? Embarking on a cross-country journey with her young son, Molly can't fathom what's in store for her, but she knows it might be dangerous - in fact, it might put all of their lives at risk. ©2016 Rhys Bowen (P)2016 Audible, Inc. Absolutely marvelous; what a wonderful novel! 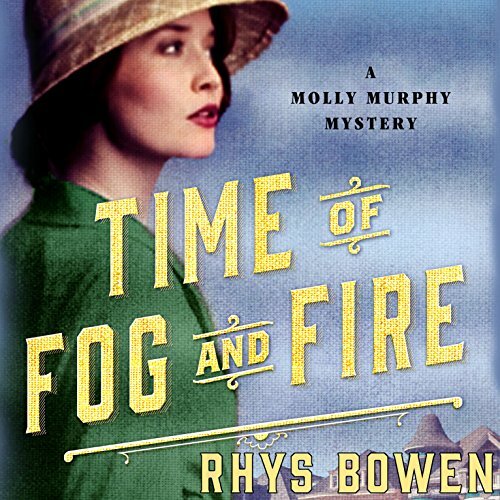 Time of Fog and Fire is set in 1906 in New York and San Francisco. Molly Murphy Sullivan, her husband (New York policeman) Daniel Sullivan, and their 18 month old son Liam find themselves in San Francisco during the great earthquake of 1906. This book and all in the Molly Murphy series as well as all those in the Lady Georgie/Royal Spyness series have my unconditional and complete recommendation for those who love mysteries. It’s hard to properly review the 16th installment of a series - if you’re already a fan and have made it this far in the series, you don’t need any feedback because you’ll read every new book no matter what! All I can offer is the same advice as what I wrote for Book 15: If this is your first Molly-Book then stop right now and start with Book 1; it's totally worth it. I have listened to the previous books in this series and found them fun. Sometimes even quite engaging. But in this one, the heroine is bizarrely stupid–blabbing about her husband's undercover operation to new acquaintances in a way detracts from any interest in the story. I don't understand why it is so highly rated. Another fantastic Molly Murphy book. This one takes place in San Francisco during the famous and deadly earthquake and fire of 1906. I couldn't stop listening to the book - Nicola Barber does a fantastic job bringing the characters to life. This one might be my favorite. Although I highly recommend the whole series! Now I need to wait a year to find out ... Well you better listen to it yourself to find out what. Ms Bowen is a wonderful storyteller! This is a wonderful listen, with ups and downs that keep you glued to your listening device! The storyteller is talented and the use of voices lends to the enthralling nature of the story. This Story was even more fun and more interestining than the ones before. The Molly Murphy mysteries are so uplifting and fun and entertaining that I hate to come to the end for awhile. I find other novellas boring to listen to and have trouble keeping from being depressed after the feeling of lightness of Molly Murphy. The ending here leaves me wanting more. I've thoroughly enjoyed this series up to this point, but this book was a huge letdown. From books 1 to 15, the author developed Molly's character from a wide-eyed immigrant to an ever improving keen detective. Yet in this book, Molly seems to have lost her good senses. She blabs every confidential detail in her possession to every person she encounters, she misses every blatant warning sign, acts and reacts on pure emotion, and basically becomes the living embodiment of every negative stereotype men of that day held against women. If you are new to this series, I highly recommend NOT starting with this one. Honestly, I wished I had skipped it and hope the next one puts Molly back on track. Loved the historical nature of this edition. Best narration so far. Molly is some adventurer. it kept me waiting for the next chapter. It had some heart breaking parts. When she thought her husband was dead and when she lost her son. I love all Molly Murphy Mysteries. The narrator was great.